With MP3 audio. You can also use this guide to reconvert DivX 3 to DivX 4+ or convert to uncompressed AVI or XVID. Tools required: DivX/XviD Codecs, ASF Codecs, MP3 Audio Codec and Virtualdub or Virtualdub1.3c or Virtualdub-MPEG2-AC3. If your source is MPEG2(SVCD or DVD MPG files) or VOB you must use the Virtualdub-MPEG2. If your source is ASF use Virtualdub1.3c with the ASF Codec. If your source is anything else you can use Virtualdub or Nandub. If your source is DV be sure to install a DV Codec. Install the DivX,XviD Codecs, ASF Codecs and the MP3 Audio Codec if you have not yet done that. Select also under Audio->Full processing (If you are only going to reconvert the video choose Audio->Direct Stream Copy and use Virtualdub MP3 Freeze). And last hit File->Save AVI. 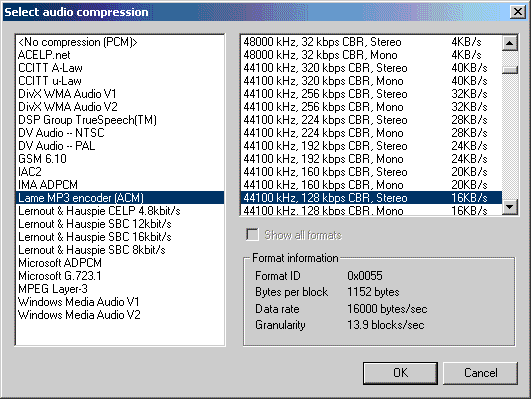 Here can you change the video bitrate, the bitrate decides how many minutes you can fit on for example a CDR. Under Filters you can add a lots of video filters, if for example you want to resize the video add the resize filter. If you want to remove black borders or crop add first the null transform filter and then click on cropping. If you would get strange lines in your video add a deinterlace filter. 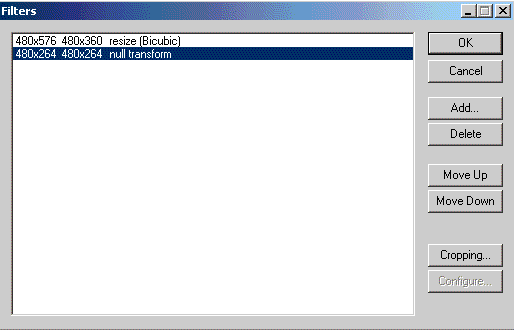 If you have a SVCD you would have to first add a resize filter, and resize it to 480 x 360 and if there are any black borders, add then a null transform filter and click on the cropping to remove them. I can't open ASF files. Be sure to use Virtualdub 1.3c cause newer versions of Virtualdub do not support ASF and be sure to install the ASF Codecs ( MP43 (Microsoft High-Speed MPEG-4 V3) ). I can't open MPG or VOB(SVCD or DVD) files. Be sure to use Virtualdub-MPEG2 cause newer versions of Virtualdub do not support ASF. I can't open DV files. 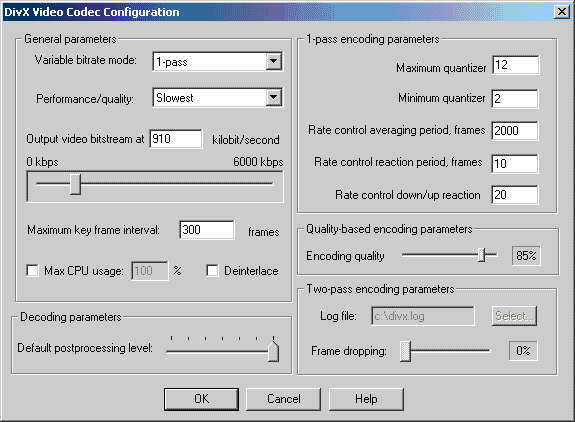 Be sure to install a DV Codec and if your DV is type 1 convert it to DV type 2. If a window popups and says that VBR audio stream detected, just ignore it cause you are goin to reconvert the audio so it will not be affected. If you would get strange lines in your video add a deinterlace filter under the Video->Filters. Search Keywords: AVI2DivX, DV2DivX, DivX2DivX, XVID2DivX, MPEG22DivX, VOB2DivX, SVCD2DivX,VCD2DivX, AVI2AVI,MPG2DivX, ASF2DivX, DVD2DivX, AVItoDivX, DivXtoDivX, XVIDtoDivX, MPEG2toDivX, SVCDtoDivX, VCDtoDivX, AVItoDivX, ASFtoDivX, DVtoDivX, AVI2AVI, DV2AVI, AVI2AVI, XVID2AVI, MPEG22AVI, VOB2AVI, SVCD2AVI,VCD2AVI, AVI2AVI,MPG2AVI, ASF2AVI, DVD2AVI, AVItoAVI, AVItoAVI, XVIDtoAVI, MPEG2toAVI, SVCDtoAVI, VCDtoAVI, AVItoAVI, ASFtoAVI, DVtoAVI.